Link Party Palooza -- and Bring in Spring Giveaway! Link Party Palooza — and Cedar Play Set or Camera Giveaway! This week’s giveaway is the Bring in Spring Giveaway! Spring is around the corner, so let’s celebrate it by giving away some AWESOME prizes. 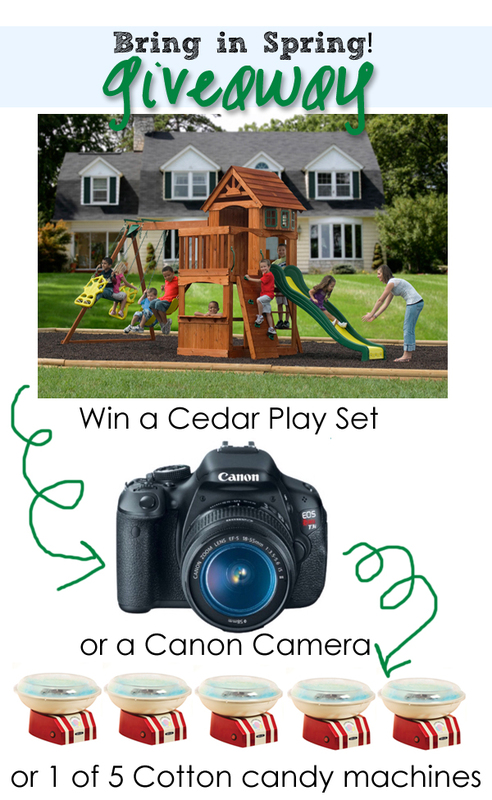 You can win a Cedar Play Set or a Canon Camera or one of five cotton candy machines. That’s a total of SEVEN winners. Enter in below for your chance to win. If you don’t have an Instagram account you should go make one! They are FREE and super easy to set up. I shared 10 ways to make your kitchen seem larger! and I showed you guys a tutorial for my new Giant Sign with Paper Flowers! Free Bunny Games Printables – Keep Kids Busy At Easter! Yummy Lemon Sugar Cookies – Easy Recipe! White and Gold Herringbone Pots! Now it’s time to link up your projects!! I can’t wait to see YOUR ideas and feature YOU!! Remember, you only need to link up once here to be listed in all of the sites’ parties — but be sure to check out each site through the weekend! We’ll each be featuring our own picks from all of the fabulous ideas! Make White and Gold Herringbone Pots! Great Ideas — 20 Easy Easter Projects! Thanks so much for the party and the amazing burst of inspiration!! Enjoy the rest of your weekend! Thanks so much for hosting the party! Hope you’re having a great weekend. Thanks for the party. Have a super weekend!! Thanks a bunch for the party, Jen!!! Have a great weekend! Thanks so much for the party, Jen! Your giant sign with the paper flower is TO DIE FOR!!! Have a fabulous weekend. Thank you for hosting a lovely party Jen! Thanks for hosting! Great giveaways too! Have a great weekend!! I love love love this party! Thanks again to everyone for hosting it. Tweeted about it as well. So excited to be a part of your link party for the first time this week. Thank you hosts and fellow bloggers for the great resources and sharing here. Thank you for a fabulous party, Jen!! Hope your weekend is filled with many extraordinary moments! It’s sure been a terrific week in creativity Jen!!! Hope you have a great weekend. Thanks so much for hosting! Happy Spring and Happy Weekend!